I am feeling a bit pissed off today because Richmond Park have decided to have a Deer Cull (apparently 2 a year) and therefore the park is closed until 7:30am. Now I normally hit the park by 5:25am and do 4 laps. This generally takes me 1hr 50 mins or 27km/hr. There are no cars at that time and I love the darkness, whilst listening to my DJ Mix. 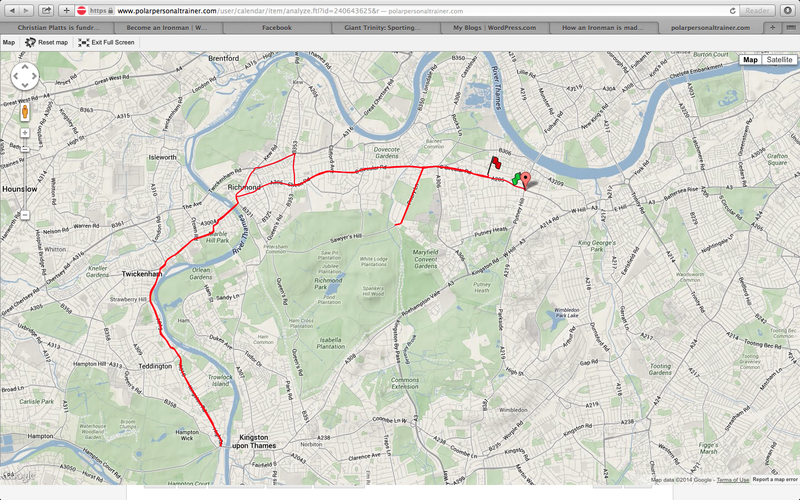 So instead I just cycled back along the main road towards Richmond and went through Richmond to Kingston. I just kept cycling and actually saw some lovely things. Anyway I thought I’ll hit the pool earlier instead and so turned round and cycled back. I covered 30Km – felt much less. The swim was good and I felt strong. I did my usual 4 X 800M. I am building up to Ironman distance and also increasing the speed, whilst reducing the amount of intervals. These morning swims I do are my endurance swims. I do Drills with the tri club twice a week – and they hurt!! Map of my off route cycle this morning! This entry was posted on February 4, 2014, 10:30 pm and is filed under Daily Blog. You can follow any responses to this entry through RSS 2.0. You can leave a response, or trackback from your own site.